YES - Obesity, generally defined as an excess of body weight of 30% or more, is the most common nutritional disease of domestic cats. Although the frequency varies from one country to the next, on average up to 40% to 45% of all adult cats are obese! Despite these alarming figures, very little is known about the detrimental effects of obesity on feline health. Obesity in cats is a known risk factor for type 2 diabetes mellitus, heart disease, osteoarthritis, certain forms of cancer and lower urinary tract disease. In humans, obesity causes an increase in illness and mortality at all ages and is associated with diabetes mellitus, certain types of cancer, impaired mobility and arthritis, high blood pressure, heart disease, and other illnesses. Recent studies suggest that heart disease also develops in obese cats! More research is needed to evaluate this and to determine what other detrimental effects obesity has on cats. 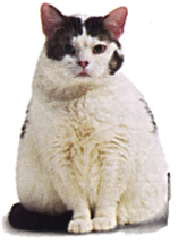 "Obesity in cats is frequently associated with hepatic lipidosis." Obesity in cats is frequently associated with hepatic lipidosis. This is a severe form of acute liver failure in cats. It typically occurs in cats that are obese and have undergone a brief period of "stress" which causes anorexia. The "stress" may be as simple as a change of house or a change in diet. When it first became recognized, hepatic lipidosis was an almost universally fatal disease in cats. Fortunately, with improved, aggressive and prolonged therapy about 70% to 80% of affected cats can now be successfully treated. However, because of the risk for this potentially fatal disease, weight loss programs for obese cats need to be done cautiously and always under the care of a veterinarian. What causes obesity in cats and how should it be treated? Many factors contribute to obesity in cats, and not all of them are clearly understood. Some are probably genetic, while others are related to diet and environment. It is important for the cat owner and veterinarian to keep these factors in mind when treating the obese feline patient. Prevention is better than treatment, but this is not always easy. Indoor cats are more prone to obesity, perhaps because they eat more out of boredom, but also because they have less opportunity to stay trim through exercise. Remember that everybody should run and play, including cats! Once a cat becomes obese, the challenge for owner and veterinarian alike is to promote safe weight loss. It is better to set realistic goals for weight reduction rather than attempting to force the cat down to a "normal" weight. Usually a 15-20% reduction in weight is a reasonable and achievable target. "Weight that is lost slowly is more likely to stay lost!" Avoid rapid weight loss since it puts the cat at risk for development of hepatic lipidosis. Weight that is lost slowly is more likely to stay lost! No drugs or magic pills can be used safely or effectively. Commercial weight loss diets are available from veterinarians and provide the basis for a successful weight loss program. However, they are more effective when combined with additional exercise. This also has the advantage of providing more time for interaction between the cat and the family, which we know provides enjoyment and is beneficial for the health of both. With some patience and extra care, obese cats can lose weight safely and effectively, with the ultimate goal of prolonging a healthy happy life!